The Cinema Saturday challenge this week is to create a card inspired by the Chronicles of Narnia movie. I was most inspired by all the snow scenes in the movie. I am also inspired to use my brayer of late. I've owned it for like 2 years and never used it much. 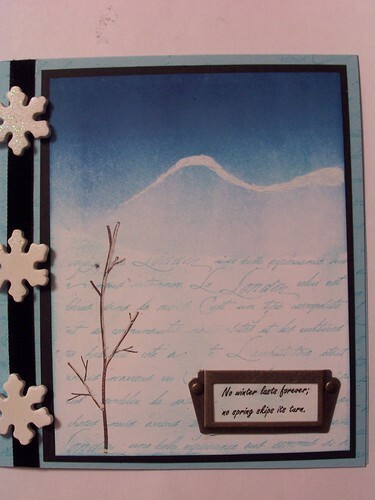 I brayered a snow scene with a snowy mountain and a bare tree. I finished the card with some wooden snowflakes I've had longer than the brayer. Wow Sara! This is amazing...I look at this and it makes me feel so relaxed and at peace. So beautiful -great card!! WOW!!!! Sara - this is beautiful!!! I absolutely love the scene that you have created and your brayering is awesome!!!! Your card has such a feel of Narnia!!! I am so glad that you played along with us and I hope that you had fun to too!!! !